THE OCEAN AT THE END OF THE LANE is a fable that reshapes modern fantasy: moving, terrifying and elegiac - as pure as a dream, as delicate as a butterfly's wing, as dangerous as a knife in the dark - from storytelling genius Neil Gaiman. 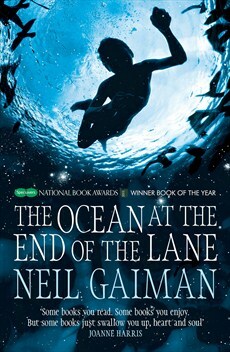 In The Ocean at the End of the Lane, Neil Gaiman tells us a very dark tale, a tale filled with bad dreams. He tells us of nasty creatures coming to our world to damage it, and of the little boy who has to confront them with the help of three very special women, living in the house at the end of the lane. While reading The Ocean at the End of the Lane, you might feel like all your childhood nightmares are coming back to you, but strangely you'll always feel secure, because Gaiman's voice is always kind and comforting. This is what makes him a great writer. Decidedly not for children, this is a really dark but also beautiful book, and that's why we recommend it wholeheartedly.